A Botswana safari is one of Africa's top experiences for visitors. Vast tracts of wilderness in pristine condition are home to huge herds of game, roaming unrestricted between the Kalahari's plains and the waterways of the Okavango. For those who enjoy the wilds, a Botswana safari holiday is perfect. With its network of private ‘concessions’ dotted with just a handful of small, well-designed safari lodges, Botswana safaris offer near exclusivity. Whether you’re watching lions stalk their prey, or taking a magical mokoro trip along narrow, reed-lined channels, you’re unlikely to come across any other visitors. The game here rarely disappoints, the birdlife can be spectacular, and night drives are a compelling further option. But all this comes with a hefty price tag: a holiday to Botswana’s safari areas is expensive. At first glance, the choices for a Botswana safari are bewildering. Public or private parks? Wet or dry areas? Permanent lodges or guided mobile safaris? Whatever your choice, Botswana safaris are seldom cheap, but can be good value. Most trips include meals, activities, laundry and park fees; some even include drinks. There are no hidden extras. You'll see superb wildlife and have pristine environments virtually to yourself. For a holiday, a Botswana safari is wild, magical and very exclusive! Botswana’s parks: public or private? The public parks of Chobe National Park and Moremi Game Reserve form the core of northern Botswana's protected areas. The wildlife and scenery here are often superb, but you will share the area with other vehicles and people so these public reserves don't offer the most exclusive of safari experiences in Botswana. Strict park rules forbid anyone in these parks from driving at night, conducting walking safaris, or driving off ‘road’ – which is especially annoying when interesting game is spotted away from the track. Lying around these parks and reserves is a patchwork of private wildlife reserves or 'concessions'; which offer much greater flexibility for activities on a Botswana safari: their guides may drive off the tracks when searching for game; most offer night drives; and some offer walking safaris guided by expert armed guides. Each of these safari reserves covers about 800–2,500km², yet each contains just a couple of small, private safari camps, with guests arriving by air. They have no campsites or public access so game viewing is generally undisturbed. Take a look at the more detailed map of northern Botswana to see the location of many of these reserves. Environment: dry or wet areas? For the purposes of deciding on your holiday options, you can divide Botswana’s safari environments very roughly into two categories: dry and wet areas. We usually advise travellers to mix different types of camps and environments, in order to experience the full range of safari activities, flora and fauna. Most camps stand on, or close to, large dry areas, which are easiest to explore by 4WD safari. It's in these drier areas that you'll usually have the best sightings of big game, plus dry-country bird species. Many camps also have access to wet areas – some with deep water, others with shallow. You'll usually explore areas with deep water using motorboats, driven by a guide. 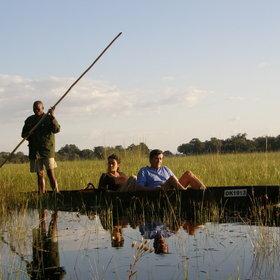 Shallower floodplains are best seen from a mokoro, or dug-out canoe. Both are excellent for birdwatching, but you'll usually see less game in a wet area than in a dry one. Permanent camps or guided mobile safaris around Botswana? All Botswana's permanent safari camps use open 4WD safari vehicles and professional safari guides, and most are very comfortable. Tents and chalets usually have en-suite flush toilets and hot/cold showers; many have fans and some even have air conditioning. Take a look at our suggestions for Botswana safari holidays, then talk to us: the team at Expert Africa can describe them from personal experience, and guide you to the best options for your trip. Comfortable camping and luxury tented safaris are a great way to explore the best wildlife areas in Botswana, led by a professional and knowledgeable guide. Join a small group of like-minded travellers on a scheduled holiday or take a private guided mobile safari to a location of your choosing on dates that suit you. See our Wild about Africa programme for a wide range of safaris to Botswana. For most people thinking of a Botswana safari holiday, the Okavango Delta springs to mind. And rightly so: it hosts Botswana’s greatest concentration of different environments. Yet the patchwork of ecosystems that makes the Delta so fascinating is found all over northern Botswana. So by all means focus on the Okavango Delta, but explore beyond this area and you'll leave with a much broader picture. Even within the Delta, there are plenty of options for visitors. As well as Moremi Game Reserve, there is an extensive network of private reserves that offer exclusive game-viewing safaris. Similar levels of big game are to be found in the private reserves clustered around the waterways of the Kwando and Linyanti Rivers, and the nearby Selinda Spillway, as well as beside the busier Chobe Riverfront. Further south, Savuti is a magical spot for mobile safaris, with fewer visitors. Fringing the Delta’s western perimeter, the Okavango River gradually widens into a huge, deep river that’s known as the Okavango Panhandle. This area doesn't have the game densities of most other areas in the Okavango, but is nevertheless interesting in its own right and can be more affordable. It’s also within striking distance of the Tsodilo Hills, where Laurens van der Post stumbled across whole galleries of ancient rock art, and can be visited as a side-trip to a self-drive safari around Namibia. No mention of a Botswana safari would be complete without the vast, flat saltpans at the heart of the Kalahari, host to fleeting herds of game and big, open skies, and encompassing the truly remote Central Kalahari Game Reserve. Then there’s the Kgalagadi Transfrontier Park, which is usually best visited as part of a holiday from neighbouring South Africa. Botswana arose from the former British protectorate of Bechuanaland in 1965, an impoverished republic whose focus was on improving the lives of its people. The timing was fortuitous; within just a few years, the discovery of diamonds was to give a massive boost to the new country’s faltering economy. With stability thus assured, the government looked to its other major resource, the environment, introducing a ‘high-revenue, low-volume’ tourism policy that has resulted in considerable protection of the country’s wilderness areas. Together, Botswana’s national parks and huge private game reserves protect about 40% of the country’s total area which is why a Botswana safari has so much scope! Much of this wilderness is concentrated in Botswana’s northern safari areas, where people are heavily outnumbered by wildlife; the majority of the country’s population of two million or so live in the south-east of the country. While Botswana is a relatively new nation, its people date back some 60,000 years to the hunter gatherers of the Kalahari. Today, their ancestors, the San (or Bushmen), are marginalised within Botswanan society, which is dominated by the Bantu-speaking Batswana; indeed, ‘Batswana’ is also the term denoting a citizen of Botswana. Although the country’s official languages are English and the Bantu language of Setswana, these are just two among some 26 languages spoken here. This diversity is also true of the environment. A land-locked country just a little larger than France, Botswana consists mainly of a gently undulating sandsheet punctuated by the occasional isolated outcrop of rock. In the north, two major features stand out: enormous saltpans, and the huge inland delta of the Okavango River. The climate follows a similar pattern to that of most of southern Africa: a ‘rainy season’ between November and April, typically followed by days of cloudless blue skies when daytime temperatures gradually rise to a sticky peak in October, but can fall below below zero at night between June and August. To understand more about the weather – and the best time for a Botswana safari holiday, see Botswana’s climate statistics.